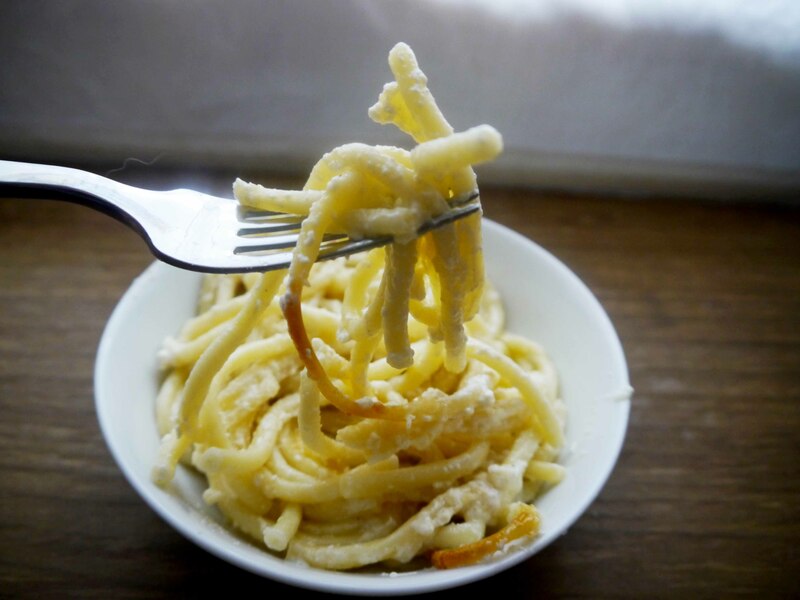 Here’s a recipe from one of my favorite restaurants: La Zucca Magica, in Nice. Unfortunately, the restaurant closed a few years ago, but I have fond memories. 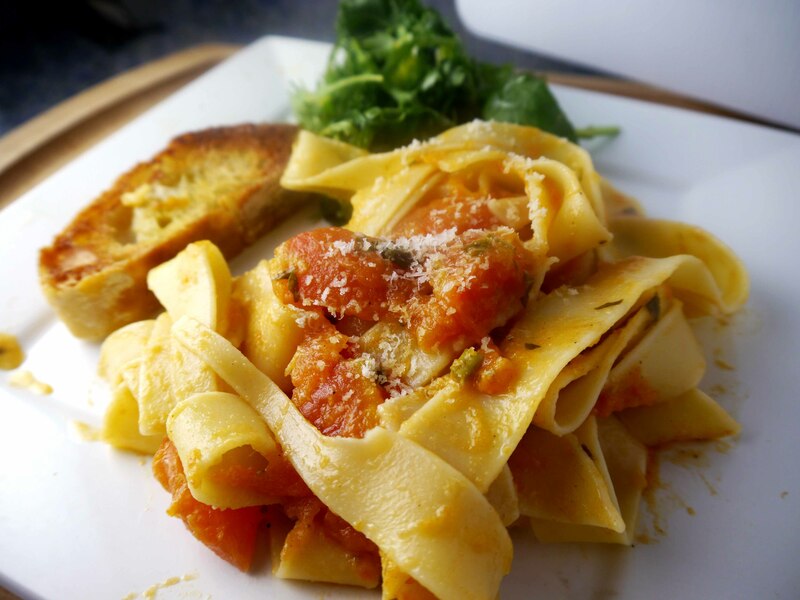 It was an Italian vegetarian restaurant that got much acclaim from guide books and the New York Times. 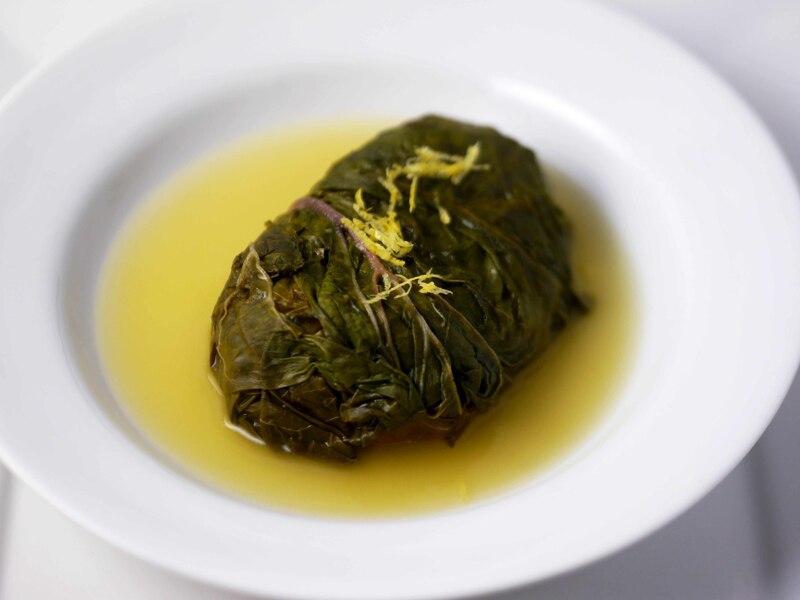 It’s best to serve these individually, surrounded by a little broth and topped with some lemon zest. Don’t let the vegetarian label fool you into thinking the dishes were light there. 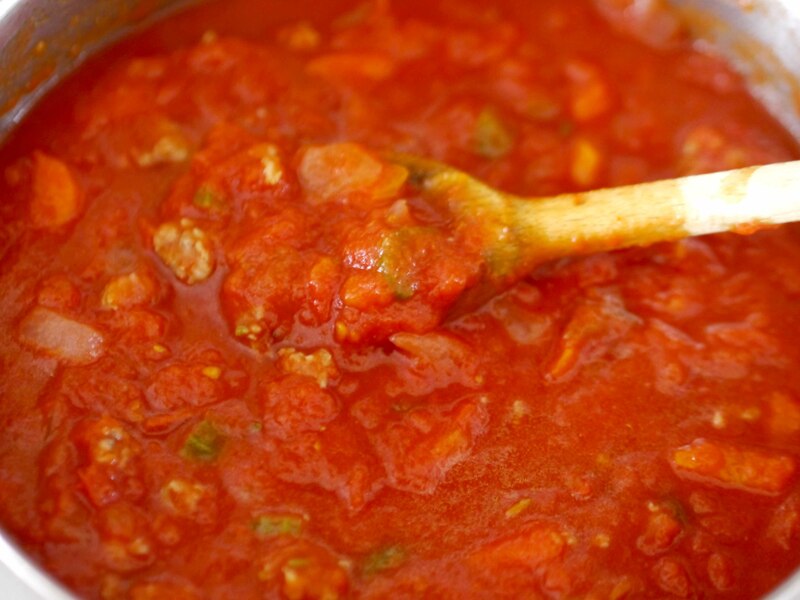 La Zucca Magica served hearty meals laden with butter, oil, and tomato sauces. I can assure you no one left there hungry. 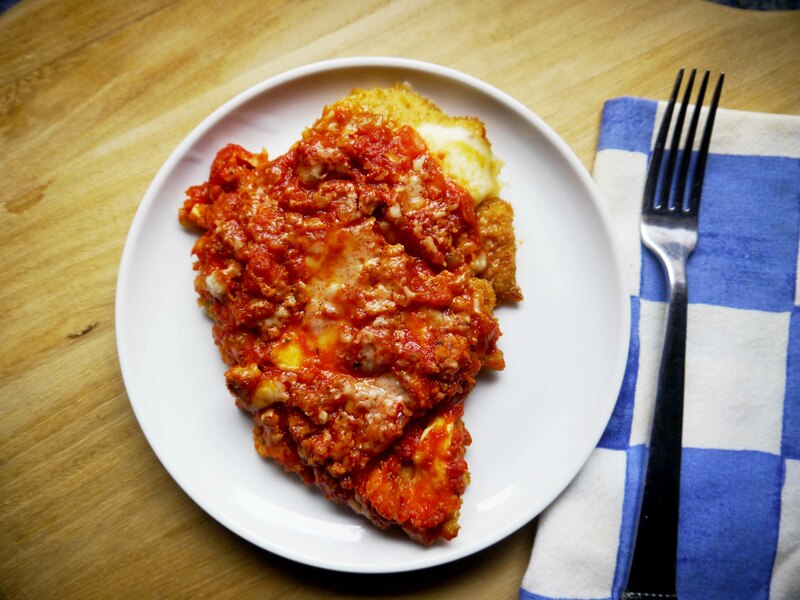 We didn’t have this dish at the restaurant but I made it when we got home using a recipe that was posted on the New York Times site that has since disappeared. And I was able to save the written recipe (see below). Choose a baking pan where the chard just about fit and are close together. 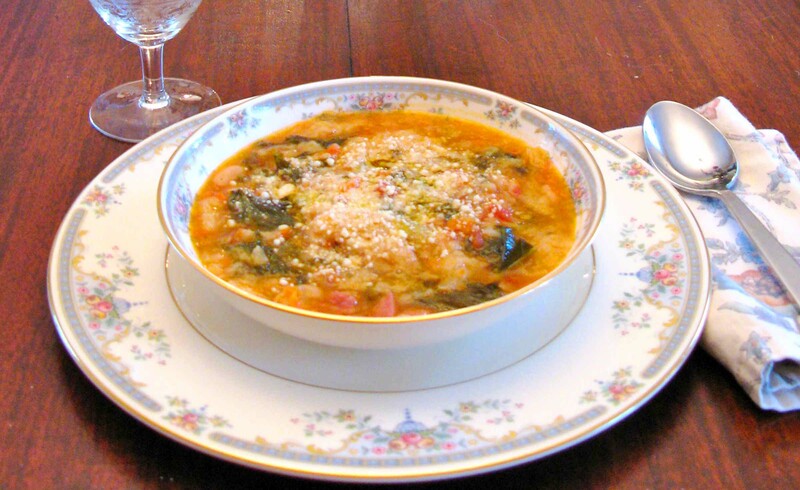 There are multiple flavors and textures that work well together in this tasty delicacy. 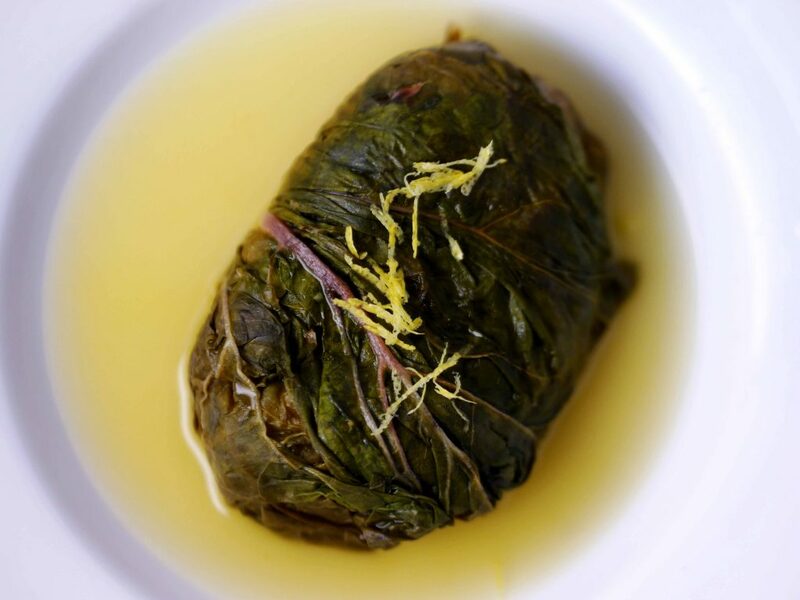 The fresh healthy green of the soft swiss chard leaves; the light mellow taste of saffron; the bite of the lemon zest; and the sweetness of the Parmesan and fresh mozzarella cheese all make your taste buds dance. This recipe calls for lemon zest. 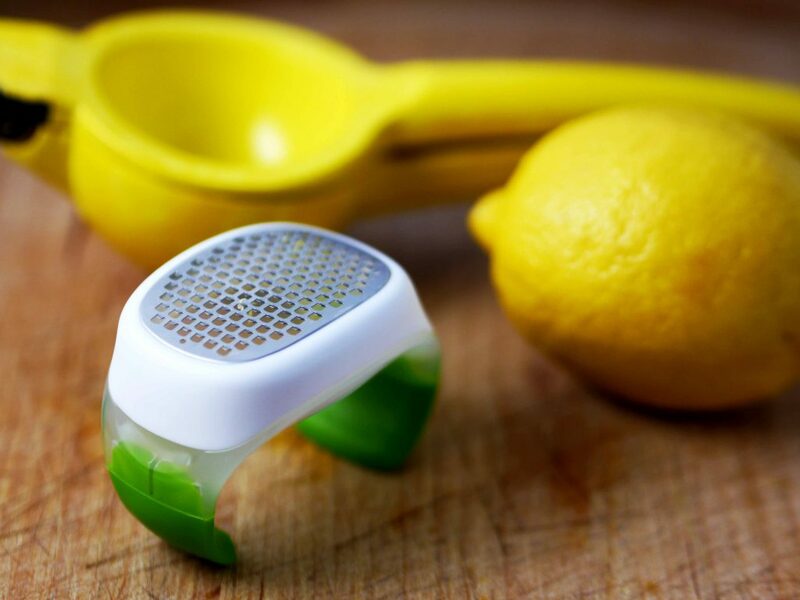 This hand-held lemon zester works great, catching the zest as you scrape. It works much better than using a cheese grater. I just got this tool as a gift and will now use nothing else. 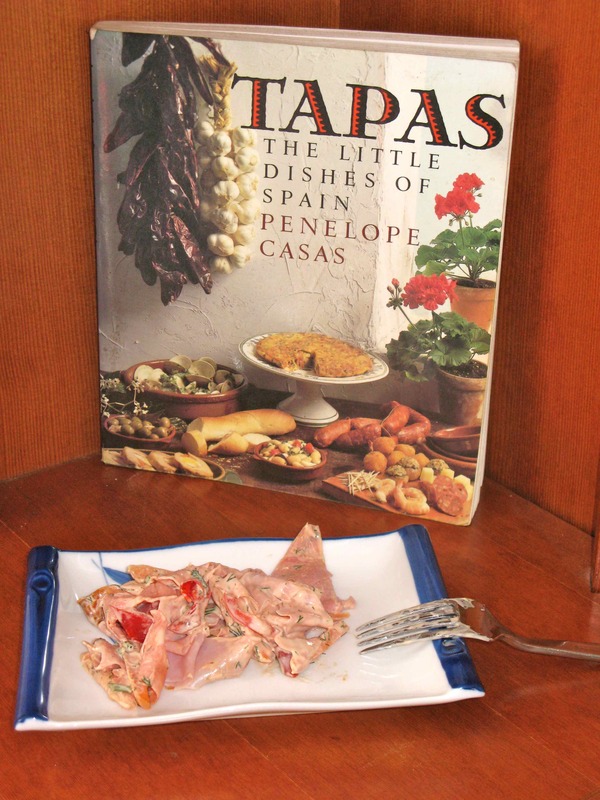 I served this as the third course in a three course meal I created from recipes I got in Southern France. Although none of the courses contained meat, the three courses were very filling. I’ve also served it in the Rootsliving dining room on Christmas Eve as a second course, before the main meal of Vegetable Lasagna Masterpiece. 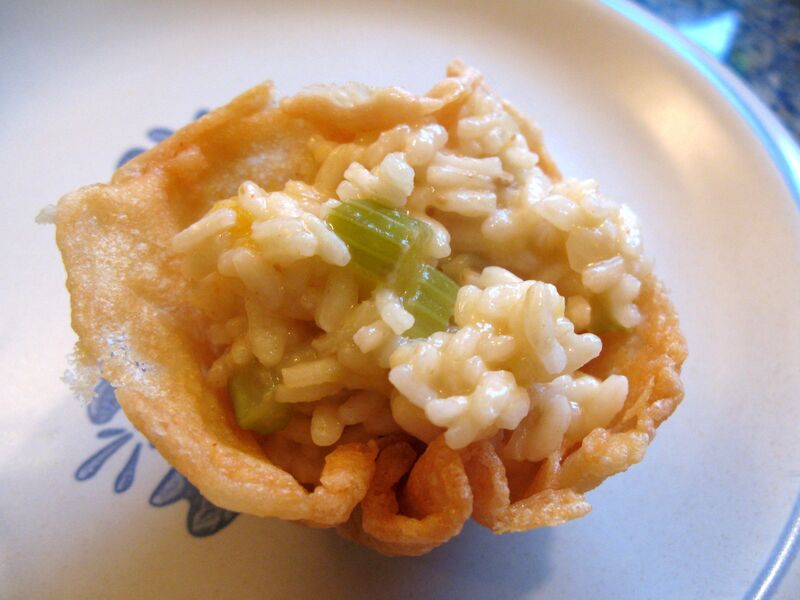 There are some skills required to making this dish, including making a good risotto. Step 1 Make risotto by heating up 1 tbsp of butter and adding the rice. Stir and let the rice get warm (about a minute or two) before adding the first ladle full of hot vegetable broth. The secret to making good risotto is to use hot broth and only add about a ladle full at a time, just enough to cover the rice. Step 2 Keep the heat on low to medium. When the first ladle full of hot broth is nearly absorbed (the liquid should still be covering the rice), add another ladle full and stir until all three cups are used. Stir just enough so that the rice doesn’t stick to the bottom of the pan. Do not leave the pan unattended until you’re done making the risotto. The rice should end up being barely tender. Step 3 Dissolve saffron in juice of one lemon. Add to rice, along with butter, Parmesan, zest of one lemon, salt and pepper to taste. Allow rice to cool a bit. Rice can be made in advance at this point (up to 1 day), but do not refrigerate it. Step 4 Poach chard leaves in about 2 cups of the remaining broth for about 45 seconds. Take out, drain on a dishcloth, and cut out the hardest part of central stem. Reserve cooking broth. Step 5 Preheat oven to 400 degrees. With wet hands, form 6 balls of rice 2 to 3 inches across. Dig a hole in each ball and insert mozzarella. 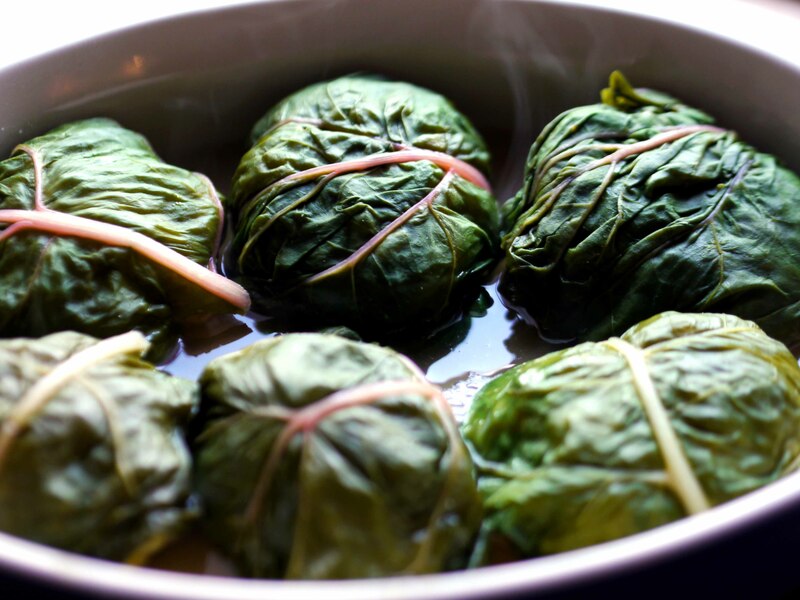 Wrap each ball in a chard leaf. Step 6 Put the stuffed chard in a close-fitting oven pan, with enough reserved broth to come about a half-inch up the sides of the balls. Bake for 20 minutes. Step 7 Serve balls topped with a little more broth, more lemon zest, Parmesan and a drizzle of olive oil. Step 1 Make risotto by heating up 1 tbsp of butter and adding the rice. Stir and then add one up of the vegetable broth. Keep heat on low to medium. When the liquid is absorbed add another cup and stir until all three cups are used. Rice should be barely tender. Step 2 Dissolve saffron in juice of one lemon. Add to rice, along with butter, Parmesan, zest of one lemon and pepper to taste. Allow rice to cool a bit. Rice can be made in advance at this point (up to 1 day), but do not refrigerate it. Step 3 Poach chard leaves in about 2 cups remaining broth for about 45 seconds. Take out, drain on a dishcloth, and cut out the hardest part of central stem. Reserve cooking broth. Step 4 Preheat oven to 400 degrees. With wet hands, form 6 balls of rice 2 to 3 inches across. Dig a hole in each ball and insert mozzarella. 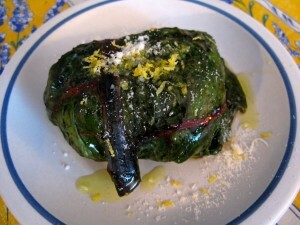 Wrap each ball in a chard leaf. Step 5 Put balls in a close-fitting oven pan, with enough reserved broth to come about a half-inch up the sides of the balls. Bake 20 minutes. Step 6 Serve balls topped with a little more broth, more lemon zest, Parmesan and olive oil.